A town with a population of more than 61,000 could become "the largest in the country without a proper police station", an MP has said. 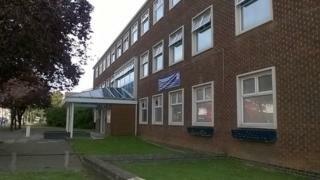 Proposals have been put forward to combine services for north Northamptonshire in one building. The move would see the closure of four existing stations - Corby, Kettering, Wellingborough and Rushden. Labour MP for Corby, Andy Sawford, vowed to fight the "downgrading of policing" in the area. He said he would demand "an absolute assurance that response police officers will be based in Corby alongside safer communities teams". "Anything less than that will leave Corby as the largest town in the country without a proper police station," he said. A report by Northamptonshire Police said the existing buildings were "inefficient and old". "We are committed to retaining a policing presence in our towns and local policing services will remain local," said Chief Constable Adrian Lee. "This is not simply about a specific building and we will work with our partners to find the best solution for each community." The new site, at North Kettering Business Park, would be the "main operational base for policing in the north of the county", Mr Lee said. Northamptonshire's Police and Crime Commissioner Adam Simmonds has approved the plans and a consultation has begun. Work could begin on the site towards the end of next year.